Dr. Jeff Masters has a nice write up or current Greenland conditions, and the Dark Snow Project. He mentions Maniitsoq, which is one of the stops we made last year on our way to the ice cap, and the site one month later of the warmest temps in Greenland’s historical record. See Above. The graph Dr. Masters uses reminded me of a similar one from James Hansen, which I’ve inserted below the fold, along with ominous results of recently published research. The message is, we’d better get Greenland right. Human-caused global warming has set in motion an unstoppable slow-motion collapse of the glaciers in West Antarctica capable of raising global sea level by 4 feet (1.2 meters) in a few hundred years, said NASA in a May 2014 press release. What’s more, one of the glaciers involved, the Thwaites Glacier, acts as a linchpin on the rest of the ice sheet, which contains enough ice to cause a total of 10 to 13 feet (3 to 4 meters) of global sea level rise over a period of centuries. This unstoppable collapse makes saving Greenland “absolutely essential”, said glaciologist Richard Alley in a May 2014 interview in Mother Jones. Greenland’s ice sheet holds enough water to raise global sea levels by 7.36 meters (24.15 feet) were it all to melt, and civilization would be hard-pressed to deal with 10 – 13 feet of sea level rise from West Antarctica, let alone another 20+ feet from Greenland. “If we’ve committed to 3.3 meters (10.8′) from West Antarctica, we haven’t committed to losing Greenland, we haven’t committed to losing most of East Antarctica,” said Alley. “Those are still out there for us. And if anything, this new news just makes our decisions more important, and more powerful.” Unfortunately, the Greenland Ice Sheet is much more vulnerable to melting than previously thought, found a May 2014 study by Morlighem et al.,Deeply incised submarine glacial valleys beneath the Greenland ice sheet. The researchers found that widespread ice-covered valleys extend much deeper below sea level and farther inland than previously thought, and would likely melt significantly from steadily warming waters lapping at Greenland’s shores. Figure 2. Monthly changes in the total mass (in Gigatonnes) of the Greenland ice sheet estimated from GRACE satellite measurements between March 2002 – July 2013. The blue and orange asterisks denote April and July values, respectively. Note that the decline in ice mass lost from Greenland is not a straight line–it is exponential, meaning that in general, more ice loss is lost each year than in the previous year. However, the mass loss during the 2013 summer melt season was probably smaller than during 2012, said the 2013 Arctic Report Card. Fig. 1 shows that Greenland has been losing mass at a faster and faster rate over the past decade, with the recent rate corresponding to ~1 mm sea level per year (1 mm sea level = 360 Gt ice). The linear fit to the Shepherd et al. data in Fig. 1 yields a Greenland contribution to global sea level of about 30 cm by 2100. Fig. 1. 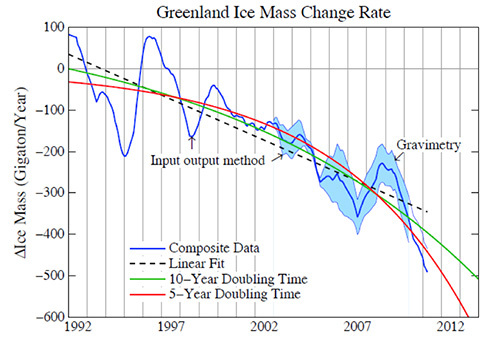 Annual mass change of Greenland ice sheet based on the input-output method, an analysis of gravity measurements, and a best-estimate composite (Shepherd et al., 2012). The increasing Greenland mass loss in Fig. 1 can be fit just as well by exponentially increasing annual mass loss, a behavior that Hansen (2005, 2007) argues could occur because of multiple amplifying feedbacks as an ice sheet begins to disintegrate. A 10-year doubling time would lead to 1 meter sea level rise by 2067 and 5 meters by 2090. The dates are 2045 and 2057 for 5-year doubling time and 2055 and 2071 for a 7-year doubling time. Meanwhile, new research of Greenland’s past suggests the ice sheet is more sensitive than previously thought. One of Dr. Box’s collaborators, photographer James Balog, who created the amazing time-lapse Greenland glacier footage in the fantastic 2012 “Chasing Ice” movie, puts it like this: “Working in Greenland these past years has left me with a profound feeling of being in the middle of a decisive historic moment–the kind of moment, at least in geologic terms, that marks the grand tidal changes of history.” On that note, I encourage you all to consider a tax-deductible donation to the Dark Snow Project. The project has already raised $30,000, and hopes to raise another $10,000. One of the major uses for the money will be to pay for the portable Internet satellite gear needed to do regular posting, messaging, and skyping from the ice during July and August. Watched “Chasing Ice” the other night—-it’s available from Netflix. A very worthwhile hour. A great post with some great graphs and some very ominous projections. I’ve said it before, but bad things happening in Greenland may be the only way to get everyone’s attention and bring on the Great Awakening.